My mom taught me how to make these cookies years ago and I am now teaching my children how to make them. We have made it a lot of fun by taking our cookie dough and coloring several batches with bright colors. We then create our own creations and let our imaginations fly. In a large bowl, mix the sugars, margarine, eggs, and almond flavoring until smooth. Sift together the flour, baking soda and cream of tartar and add to the above creamed mixture. Mix well. Divide the dough into 4 or 5 equal amounts keeping one part white and adding bright food colorings, one color to each of the other batches. Refrigerate in separate bowls for 1 hour so it is easier to handle. Remove from the refrigerator and create the cookies using all the colors. Bake the cookies on greased cookie sheets in a 375F (190C) degree oven for around 8 minutes. Do not over-brown. Remove and place on wire racks to cool. 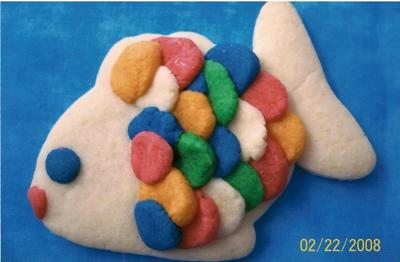 Some examples are the fish that I made and the turtle that was my five year old's creation. When we are finished we take all the left over colors and mix the doughs together to make marble cookies. These photos were taken in 2008 but we make these every year and have so much fun making them and eating them. These look great! The kids will have a lot of fun trying them. Thanks! The fish are too cute to eat! 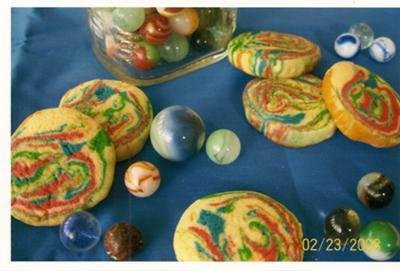 The photo of the marble cookies is great, like how you displayed them with real marbles. 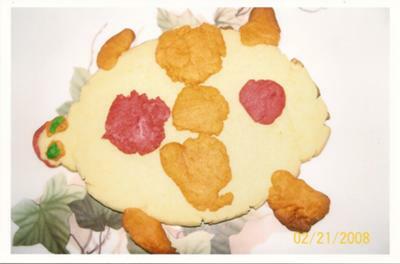 The turtle cookie is evidence that your son had fun with mom. This is awesome! Very cute cookies, and great idea!! !